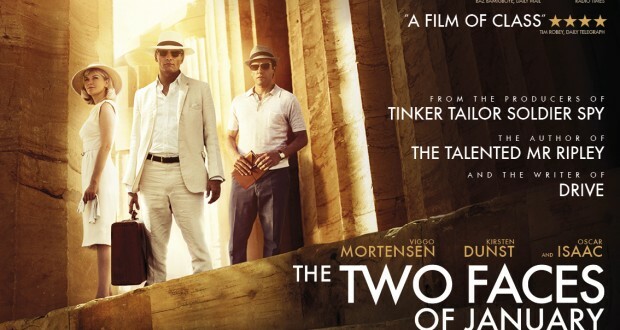 Two stars for Two Faces, more like. A real shame. A beautifully shot and well acted reboot of a regurgitated plot line that has been done so many times before and so much better by its supposedly “dated” predecessors. The film revolves around a con artist, his wife, and a stranger who try to flee to a 1960s Greece after one of them is caught up in the murder of a police officer. At its core, it’s a film noir. A genre that I am an avid fan of. The only problem is that just because it has the story of one, does not make it so. Or make it any good for that matter. Two Faces opens with Rydal (Oscar Isaac – Inside Llewyn Davis), a Greek speaking American tour guide that impresses and cons the rich tourists that come across his path. He only takes what he needs and we soon get an insight into the way he works. A slow burning but watchable opening as Rydal scouts the picturesque Acropolis waiting for his next target. However, the next couple to be caught in his cross hair are the MacFarlands (No, not of the Family Guy variety but the powerhouse that is Viggo Mortensen and the lovely Kirsten Dunst). Rydal soon becomes intrigued, obsessed, with Chester (Mortensen) and he weasels his way into the couple’s vacation. The opening does feel like you’re watching the actors on holiday (but in costume, obviously). With the beautiful Greek landscape caught by the talented cinematographer Marcel Zyskind, I was happy to let it carry on chugging along (Enviously wanting to go on holiday as each minute ticked on). Mortensen’s presence and performance is the major highlight in this film. He has proven countless times before in Lord of the Rings, Eastern Promises and A History of Violence that he can deliver the goods. Even the little things; his looks and grimaces flesh out a character that should be stocky. His paranoia and curiousity as to why Rydal is watching him creates a little suspenseful encounter. Rydal undercutting him with every sale between the market traders makes a good little running joke. BUT it’s all rather tame. Even the playful sexual tension brewing between Dunst and Isaac under Mortensen’s menacing, watchful eye feels like it won’t go anywhere. David Warshofsky’s (Captain Phillips/The Mentalist) creepy detective soon bursts the bubble of bliss and drops the bombshell that (surprise, surprise) the MacFarlands are not who they seem. A predictable, if violent, altercation with Chester leads to them becoming fugitives on the run. The first act of this piece was actually quite watchable and suspenseful. It’s just a shame that the film goes downhill after that. The flailing pace dips in and out, reprieved only by moments of frenzy from Mortensen and tense but predictable encounters with border patrols. There are a couple of twists along the way, but if anything it could kills the little tension that was keeping this film going and to be frank, just disappoints. Dunst’s character was hardly memorable. Anyone could have played her. It seemed more a game of wits between Chester and Rydal, with Dunst’s Colette being a really poor bargaining chip. I mean an exchange between her and Rydal left things a little cryptic; did they get together? Did they do . . . anything? But it all doesn’t surmount to anything. If not for Mortensen’s decline into depravity and his paranoia turning him into a volatile drunk, the film would have been a complete write off. The films soon comes to an inevitable chase around the cobbled streets of a Turkish village which picks up a meandering movie and makes for a predictable but engaging finale. My main issue is it had the cast, the look, but no heart or real story. Zyskind’s cinematography is impeccable. He’s even able to make the rubbly ruined Greek outback a sight to see. It seemed that director Hossein Amini had just painted the little drawings by numbers, hoping no one will notice. Looks good but something was missing. I would invest in a “dated” classic noir. Because although the music and acting may be a little OTT, they are still better than poor affairs like these.